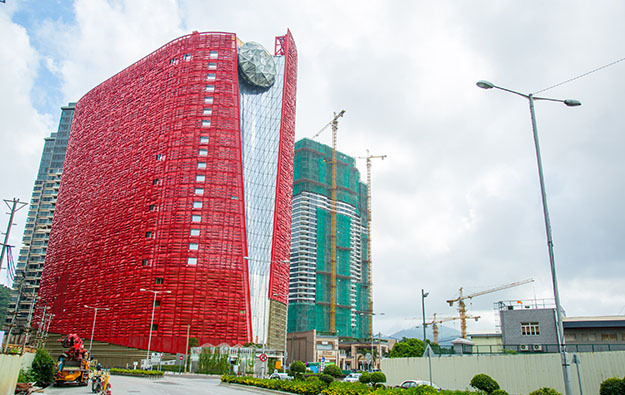 Management for The 13 Hotel (pictured), a project on the Cotai-Coloane border of Macau, has been told it must “apply for reinspection” regarding its hotel licensing process, GGRAsia has been told. “The inspection of The 13 Hotel was carried out early this month. There are still unfinished works inside the hotel, so the hotel applicant needs to apply for reinspection once they are completed,” we were informed via an email from the Macao Government Tourism Office (MGTO), in response to our enquiry. In a March 27 filing, the venue’s developer, Hong Kong-listed The 13 Holdings Ltd, revised the opening date for its hotel project to June 30. Several previous deadlines declared by the firm have already been missed. In late January it said it hoped to launch the hotel “on or before” April 30. The tourism bureau is responsible for licensing hotel operations in the city. The body had previously told GGRAsia that it had received on May 25 a request for MGTO inspection of the property. GGRAsia asked the tourism bureau for clarifications regarding what work still needed to be done, and whether the hotel had failed an MGTO inspection or simply been asked to reapply. The 13 Holdings also aspires to have a casino on the site. That requires a request being made to the government by one of Macau’s six licensed casino operators, according to a previous statement by Lionel Leong Vai Tac, Macau’s Secretary for Economy and Finance. The 13 Holdings has said it expects to operate a total of 66 gaming tables if it gets permission for a casino under a so-called service agreement with one of the city’s licensed gaming operators. It has widely been reported that Melco Resorts and Entertainment Ltd was a possible partner in such an arrangement – and might supply the needed gaming tables for the 13 Hotel. Melco Resorts’ chairman and chief executive Lawrence Ho Yau Lung was asked about it in March by the media but did not give a direct answer to that question. On June 14, the city’s casino regulator, the Gaming Inspection and Coordination Bureau, confirmed to GGRAsia that Melco Resorts’ new US$1.1-billion hotel tower Morpheus, at the City of Dreams Macau casino resort, would not be given table quota this year for its gaming areas in relation to the city’s table cap policy. Melco Resorts was however given permission to move 40 tables from elsewhere in its Macau operation, for use in Morpheus.